Howard Phillips Lovecraft (1890-1937) has been described variously as the successor to Edgar Allan Poe, a master of the Gothic horror tale, and one of the fathers of modern supernatural fantasy fiction. Published originally in pulp magazines, his works have grown in popularity since his death, so that more than thirty editions are currently in print. Yet only recently has Lovecraft received serious attention from literary critics. And until now—the centennial year of his birth—no one has examined his work from a post-structuralist perspective. Donald Burleson fills that void, for the first time in an extended study bringing the resources of deconstruction to bear on the works of this modern gothicist. In an introductory overview, Burleson gives an unusually readable account of deconstruction theory and terminology, a field all too often discussed in densely opaque fashion. He goes on to deconstruct thirteen Lovecraft stories, delving into their fascinating etymological mazes, abundant ambiguities, and shifting levels and meanings. His lively and remarkably jargon-free readings explore Lovecraft’s rich figurality to unprecented depths. At the same time Burleson develops the view that in practicing self-subversion and structural displacement, literary texts perpetuate themselves. 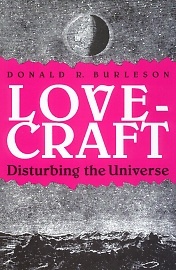 His final chapter explores the broad themes running through Lovecraft’s fiction, arguing that these themes in themselves prefigure the deconstructive gesture. This insightful and provocative volume will go a long way toward displacing the label of popular writer and establishing Lovecraft as an important figure in American literature. Lovecraft: Disturbing the Universe. By Donald R. Burleson. Lexington, KY: The University Press of Kentucky; 1990; ISBN 0-8131-1728-3 (hardback).